The Yashica YE is a 35mm rangefinder camera manufactured by Yashica in 1959. It features a Leica screw mount. The lens is usually a 5cm Yashikor f/2.8. 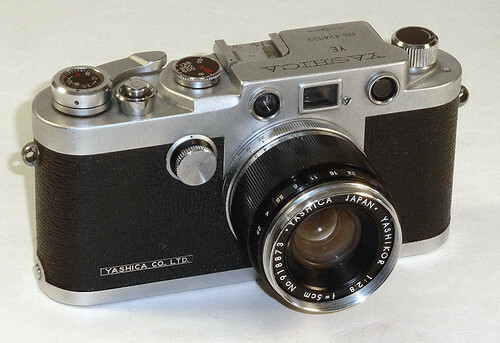 Yashica aquired Nicca in 1958 and the design of the camera is based on the Nicca 33. It has a separate focus and viewing finders. Film loading is done on the base of the camera, along with a typical thumb advance lever on top of the camera, which the frame counter is also mounted. There are two shutter dials, one for fast speeds on top of the camera by the acessery shoe, the other a slow shutter speed dial on the front. The slow speeds are from 1/2, 1/4, 1/8, 1/15, 1/30. The fast speed dial contains B, 1/30-X which is also the flash sync speed, 1/60, 1/125, 1/250 and 1/500. This page was last edited on 5 April 2019, at 05:50.